I've noticed a disturbing trend in the past 30 or 40 years. It used to be that heroes were heroes. Period. Superman stood for truth, justice, and the American Way. The Lone Ranger wore a white hat and only shot bad guys in the hand to stop them from shooting someone else. Robin Hood robbed from the rich and gave to the poor. George Washington and Abraham Lincoln epitomized virtue and vision and laudable leadership. Real or mythical, they weren't perfect, but they were always good because they stood on principle and fought with courage. Courage is doing the right thing even when you're scared, even if it's hard, and often when everyone else has taken a different path, an easier path, a more socially acceptable path. Recent years have redefined heroism, I suppose as an acknowledgement that everything isn't always black and white. The good guy doesn't always ride in on a white horse, and the bad guy doesn't always sport a cape and handlebar mustache like Snidely Whiplash. Bad guys, as it turns out, aren't always all bad. Yes, there is evil in the world, but there are also good people who do bad things for complicated reasons. And there are bad people who do good things for other, even more complicated, reasons. So if bad guys are so complex and misunderstood and sympathetic, then maybe, they reckon, our heroes shouldn't be so shiny either. Maybe their white hats should be a little scuffed and dirty, and maybe their images need a little tarnishing. And so the pedestal toppling began. Before long, we were embracing all sorts of heroes with fatal flaws because that made them more real, more believable. After all, if regular people can't live up to those heroic ideals, well, then, knocking them down a few notches should make it easier for the rank and file to relate to them. And so our heroes began to be a bit more common and a little less ideal. Now, I'm not talking about inherent weaknesses like Achilles' heel, or Superman's Kryptonite. I'm talking about heroes who are functioning alcoholics and drug addicts. Heroes who cheat on their wives and abandon their children. Heroes who enjoy killing people. Heroes who break the law with impunity and answer to no one. This is the new breed of heroes that we, as a society, have embraced. It's not just in our movies. The music industry is awash with hollow heroes. The NBA and the NFL have rosters that are full of thugs. Politicians and leaders of industry are constantly under investigation for one felonious thing or another. And if that isn't bad enough, revisionist historians armed with axes sharpened in the woodshed of political correctness have gone after legitimate American heroes wholesale, tearing down centuries of goodness with no other purpose than to prove that everyone is and ever has been incapable of rising above the dirt from whence they came and to which they will ultimately return. Personally, I'm getting pretty fed up with this whole "lower the bar" attitude. We need heroes to look up to, to remind us that we can -- and should -- be our best selves, even when it's hard or unpopular. Maybe especially then. 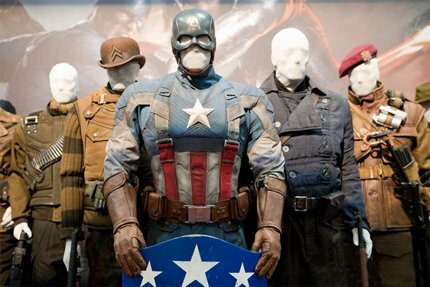 So when the original Captain America: The First Avenger came out in 2011, I was really pleased that the writers and directors of that movie made the brave choice to make Cap a hero from the inside out. Set during World War II, the story unfolds of a scientist working with a secret military unit to develop an army of super-soldiers by injecting select subjects with a secret serum. The topic of much debate between the general in charge and the scientist creating the serum was who would be selected as the official guinea pig: a large, brutish, well-trained soldier (the general's choice), or a laughingly small, frail excuse for a soldier who was fearless in his contempt for bullies (the scientist's choice). The scientist prevailed, and puny Steve Rogers was transformed by some miracle of science into a chiseled, champion-sized fighting machine. More importantly, however, Steve Rogers did not trade his humility and honor for muscles and manliness; his physical prowess did not replace his principles. What made Steve Rogers (aka Captain America) a great hero was that he had already committed to living a life of courage and honesty and integrity when he was not big enough for the army to take him seriously. When he was transformed physically, he didn't abandon the principles that defined his life; he was true to himself and the values he espoused. And in the darkest days of World War II, Captain America proved that although you may be covered in dirt and blood and surrounded by horrible atrocities, you don't have to succumb to it. As it turns out, a light shines brightest in the darkness, not in the light of day. He did good in the face of evil, and he inspired others to be better, as well. That's what defines a hero. Ultimately, in a self-sacrificing act, Captain America dies in a plane crash in order to save the lives of countless others. Later (much, much later), we discover that Cap was actually frozen and, because of his altered metabolism, survived in a state of cryogenic stasis for several decades before being brought back to life in the present day. Then they draft him into the Avengers, and he keeps fighting bad guys, even with a chronic case of culture shock from waking up nearly 70 years after his near-death. And that is where Captain America: The Winter Soldier picks up, and Cap is still fighting for the ideals and principles which shape him. Only, he begins to question ideals and principles of those he works with and for and whether or not they have crossed over onto morally shaky ground. Much of Captain America: The Winter Soldier deals with these issues, and particularly whether preemptive, lethal strikes against individuals and organizations in the name of the greater good is, in fact, good at all. Other core issues deal with powerful people protecting powerful people, even when their stated ideologies seem in immediate conflict. Secret organizations hidden in plain sight behind walls of respectability, run by folks who seem trustworthy and committed to the cause of peace. In fact, if you strip away the fantastic nature of the weapons and machines and remove the costumed heroes, what you have is a very timely, sobering observation on the state of our society. So yes, this movie is clearly make-believe, but only on the outside. Underneath, the moral and ethical issues at stake are very much the issues we have to deal with today, individually and collectively. In fact, they are issues that humanity has always had to deal with, and will continue to confront for the foreseeable future. The lines on the maps change, weapons evolve, and what constitutes wealth and power shifts over time, but truth and righteousness cannot be altered. And that is what Captain America stands for. Now I suppose some of you are thinking, "Get a life. Get over it. It's just a movie about a superhero who graduated from comic books to the big screen, nothing more." Maybe, but I don't think so. I think the stories we tell as a culture define us even as they reflect the complexity of this shared experience we call life. Why Captain America is important is that with his whole world collapsing around him, he still chooses to do the right thing. It is a choice, not a requirement, and it doesn't always reflect the choices others are making around him. He is confronted by compromisers and liars and well-intentioned but misguided fools. He is surrounded by apathetic appeasers as well as those who have sworn allegiance to unholy alliances. He makes mistakes, yes, but never forfeits his right and responsibility to choose how he acts. We need heroes like that. And we can be heroes like that. Heroes to our spouses and to our children. Heroes in our communities and in our churches. Heroes at work and stuck in traffic. Captain America: The Winter Soldier is a reminder that goodness is not outdated, and living heroically is not the exclusive stuff of legend and fairy tale. Being a hero doesn't require a flashy costume or super powers. It requires a commitment to living a principled life, and sticking to those convictions when life gets complicated. It's making promises and covenants with the intention of keeping them, not with the false notion that they are somehow disposable, and honoring them even when no one is looking.